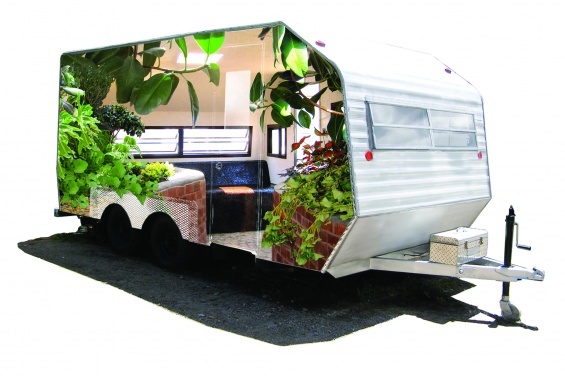 Trailer Park is a portable, natural public park housed inside a fourteen-foot mobile trailer. The interior is fully planted and treated as a “real” park. Hand-laid brick planter beds are complemented by masonry laid in the same tradition as in public parks. Concrete and wooden benches invite visitors to rest and enjoy the park view. The stone waterfall and fishpond soothe while skylights and windows allow rays of light to kiss the interior. The plants in Trailer Park are native to the state of New York and include mosses, succulents, grasses, miniature trees, shrubs, and wildflowers. Trailer Park was conceived in order to bring more nature into the urban environment. It is the culmination of inquiries into public art, environmental art, and landscape design. The concept of the laboratory, living ecosystems, modes of transportation, transcendent experiences, works of public art, and mobile healing gardens are all wrapped up in one singular work. Visitors to the Trailer Park go inside to go outside. If you cannot go to the park, this park can go to you!